Dr. Eugene J. Fine. Dr. Feinman invited me to contribute a guest blog on our recently published cancer research study: “Targeting insulin inhibition as a metabolic therapy in advanced cancer: A pilot safety and feasibility dietary trial in 10 patients” which has now appeared in the October issue of the Elsevier journal Nutrition, with an accompanying editorial. Today’s post will focus on this dietary study, and its relation to the general problem of cancer and insulin inhibition. Part II, next week, will discuss in more detail, the hypothesis behind this study. Richard has already mentioned some of the important findings, but I will review them since the context of the study may shed additional light. Comments to Richard’s post noted that almost 100 years ago Otto Warburg described how many cancers depend on glucose for fuel, and remarkably, that the cancers relied on anaerobic glycolysis for energy even under aerobic conditions. In contrast, normal skeletal muscle, for example, might rely on anaerobic metabolism in a sprint but would switch back to aerobic respiration (and reliance on fat) after slowing to a walk. The stubborn use of glucose and glycolysis by cancer cells has been termed “The Warburg effect.” The important point is that anaerobic metabolism relies on glucose and strictly glycolytic cells cannot use fatty acids for metabolism. Meanwhile, the 1982 Food Pyramid encouraged Americans to eat 300-400 grams of CHO per day. Many followed their advice, now to their regret, and at least 90% of these CHOs were sugars, or starches that digested to sugars, all useable by many cancers. So at first we thought we might starve tumors by limiting dietary carbohydrate (CHO), obviously a major source of blood glucose. It took us less than a day of literature review to recognize that CHO restriction would not starve most cancers because they are usually excellent at pirating glucose at blood glucose concentrations way below the normal range. A few words about me: I’ve been fascinated with the Warburg effect since medical school. My specialties are Internal Medicine and Nuclear Medicine. One of the radioactive isotopes that we use in Nuclear Medicine is Fluorine-18 (written 18F) which emits positrons. (Positrons interact with other substances to emit gamma rays, high energy light waves that mostly pass through tissues and can be detected on a PET (positron emission tomography) scan. We do a lot of PET scans of patients with cancer using an injected radioactive form of glucose labeled with 18F, 2-deoxy -2-[18F]fluoro-D-glucose, or FDG for short. Cells take up FDG but do not metabolize it and we can see on a PET scan where the glucose-avid cells are. PET scans with FDG work extremely well in cancer precisely because of the Warburg effect — i.e. many cancers depend on glucose for their fuel. In Fig. 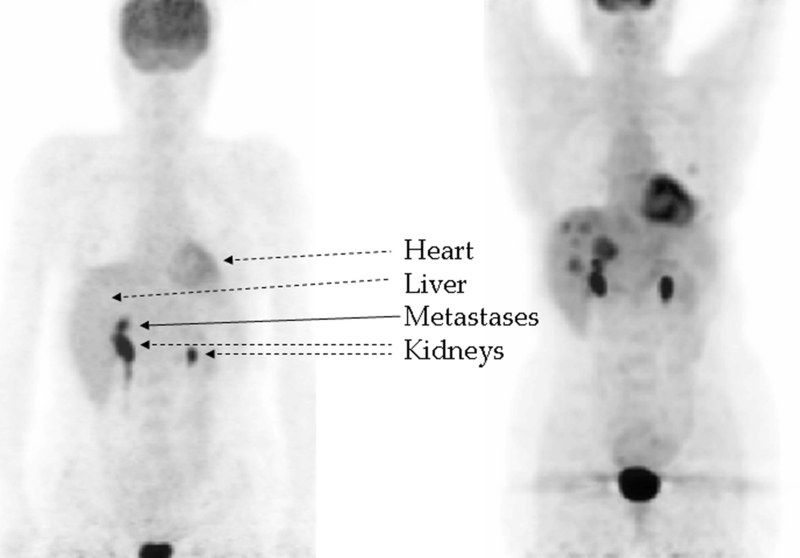 1 (left, below) the scan shows a small metastasis in the liver, just above the kidney; Fig. 1(right) shows same patient now with many new liver metastases and one new spot in the lung. The PET scan is done by injecting a small amount of FDG into a vein, then waiting for the tracer to distribute by blood flow to the body’s tissues. After about an hour the patient is placed on a narrow table and the PET scanner, really a very expensive camera, circles the patient while taking pictures (capturing the emitted gamma rays) showing the FDG distribution as in Fig. 1. The heart and brain normally use a lot of glucose, so they “light up” with FDG, and, due to FDG excretion, kidneys and bladder are also seen well. There’s normally only mild background uptake detected in other tissues. Intense uptake in an unexpected location strongly suggests a primary cancer or a metastasis. For this reason, PET has become very useful in the management of many cancers, where it can show tumors clearly and can demonstrate the effects of treatment. My early interest in the Warburg effect was obviously fueled by what PET scans could show us. A word of caution: Cancers resist overly broad generalizations. Notice that I always say “many cancers” and not “all cancers.” Otto Warburg made a very important observation, but he went a little too far by stating that persistent glycolysis was the common feature of all cancers. The observation holds up well for many aggressive malignancies but by way of counterexample, 80% of prostate cancers are not especially aggressive, nor are they avid for FDG (or glucose), i.e. the Warburg effect does not apply. Back to our study idea: We realized that gluconeogenesis and release from glycogen stores would prevent blood glucose concentration from falling to a level low enough to starve cancer cells. However, it became clear that by reducing insulin signaling, dietary CHO reduction would cause many effects which were known to inhibit cancer growth. Some of these were systemic, such as ketosis triggered at CHO restriction to less than 50 grams/day. Ketosis had been reported to inhibit cancer growth in cell culture studies in our lab and others (1,2), animal cancer studies (3,4) and a case study of two children with brain tumors (5). Other expected effects are changes in all the intracellular signaling molecules downstream of the insulin receptor, which regulate their growth, proliferation, and resistance to apoptosis (cell death signals known in all cells), etc. In the last blogpost, Richard described an animal study which demonstrated insulin’s involvement in downstream signaling and response to diet in cancer. Cancers are now being treated with drugs that individually target these intracellular signaling molecules that are controlled by insulin. These new drugs have shown some efficacy but are often limited by side effects due to the drug interactions with normal tissues. Normal tissues, however, are tolerant of the effects of reduced insulin signaling. This is apparent from the safety of low CHO diet investigations in overweight people and people with diabetes as well as healthy subjects of normal weight. It seemed reasonable to us that a low CHO insulin inhibiting (INSINH) diet could target the same molecules as the drugs and could plausibly inhibit or even kill cancer cells, but would be safe for normal tissues. So, if a study showed safety/feasibility as well as some evidence for efficacy, it would open the door for further investigation of this diet at least as an adjunct to drug therapies. In short, an INSINH diet, by systemic and synergistic effects on multiple signaling molecules, might eventually be shown to reduce drug doses and therefore side effects, boosting efficacy at the same time. What was most surprising to us was that nobody had done this before. Our goal was to implement a ketogenic INSINH diet for 28 days to see if this diet was safe and feasible in cancer patients and to test for efficacy using the change in FDG uptake on a PET scan. We were striving for ketosis, i.e. the strictest type of low carb diet, with the thought that we might engage/recruit as many cancer inhibitory mechanisms as possible. Diets are hard, but almost anyone can stay on a diet for a month—and we wanted the patients to have a chance to succeed. Furthermore, PET scans are very sensitive: some cancers show changes due to treatment as early as a week, so a month might even permit us to see evidence of improvement on the scan. What about the results? Ten patients is too small a sample to draw firm conclusions. And it wasn’t so easy after all to get ten sick patients to do this trial. Four of the patients continued to have progressive cancer by our follow-up PET scan at one month, while five patients showed stable disease and one, a partial remission. We’d agree that these findings aren’t so remarkable in themselves. But the details are much more interesting: The patients with the worst PET scan results at study’s end were principally those who had the least degree of insulin inhibition, i.e. the least amount of ketosis (only five times their baseline level); whereas those that had the best PET scan results were those that had the most insulin inhibition, or the most ketosis (17 times baseline)—see A below (where β-hydroxybutyrate is the ketone body we measured); asterisks represent a significant difference (p<0.02). Figure B confirms a general inverse relationship between the extent of ketosis and insulin concentration, expected from CHO restriction (p<0.03). It should also be noted that all patients reduced overall calorie consumption and 9 of 10 lost weight. Calorie restriction has been postulated to have effects similar to those we’ve suggested. (We tried to over-feed the patients in order to maintain weight and calorie intake, but it didn’t work: very low CHO diets do indeed cause spontaneous calorie restriction and weight loss, even when you try to prevent that.) But in our study, neither the extent of calorie reduction nor weight loss showed any relation with the PET findings (see C and D, above). Nevertheless, we couldn’t completely exclude that the calorie reduction played some contributory role. In conclusion the best metabolic response to the INSINH diet gave the best PET scan response, the worst metabolic response gave the worst, but calorie reduction and weight loss did not demonstrate a measurable relation to PET outcome. Our trial might be viewed as an unremarkable pilot study with too few patients to draw many inferences. But that would miss the point. We think what’s more important is that we may have opened a door, long overdue, to systemic study of dietary compositional change in cancer therapy– an insulin inhibiting diet is now worth a further look!! We hope there will now be the opportunity to study INSINH diets in more patients; to see if standard therapies and newer drug treatments can be improved by dietary adjunctive therapy; to find biomarkers to pre-identify which patients are/aren’t likely to benefit from diet; to tease out the effects of calorie restriction from those of carbohydrate restriction. The next post will describe in more detail the underlying hypothesis about carbohydrate restriction/insulin inhibition as a potential therapy for cancer. 1. Demetrakopoulos GE, Brennan MF. Tumoricidal potential of nutritional manipulations. Cancer Res. 1982;42(2 Suppl):756s-65s. 2. Magee BA, Potezny N, Rofe AM, Conyers RA. The inhibition of malignant cell growth by ketone bodies. Aust J Exp Biol Med Sci. 1979 Oct;57(5):529-39. 3. Mavropoulos JC, Isaacs WB, Pizzo SV, Freedland SJ. Is there a role for a low-carbohydrate ketogenic diet in the management of prostate cancer? Urology. 2006 Jul;68(1):15-8. 4. Moulton CJ, Valentine RJ, Layman DK, Devkota S, Singletary KW, Wallig MA, et al. A high protein moderate carbohydrate diet fed at discrete meals reduces early progression of N-methyl-N-nitrosourea-induced breast tumorigenesis in rats. Nutr Metab (Lond). 2010;7:1. 5. Nebeling LC, Miraldi F, Shurin SB, Lerner E. Effects of a ketogenic diet on tumor metabolism and nutritional status in pediatric oncology patients: two case reports. J Am Coll Nutr. 1995 Apr;14(2):202-8. Thanks for a clear outline of this work. What’s your opinion of what has been called the “reverse Warburg effect”? First, great post. Nice to know it’s not all that simple. But then, not such a great post as it still views the problem from a too narrow angle in my opinion. There’s more to glucose than an energy substrate or even its influence on insulin. Just like there’s more to fat than an energy substrate. Let’s hope your following posts expand on the idea. – Glucose – immune system. – Glucose – advanced glycation end-products. With insulin, it’s pretty simple. Insulin regulates the balance between glycolysis and lipolysis. In a normal person, this applies to cells individually. But in cancer, this also applies to cancer cells vs normal cells. Cancer cells get more of what they want, normal cells get less of what they want. Meaning that cancer cells get more glucose, normal cells get less ketones. The imbalance between the two means cancer cells have access to a greater source of energy, normal cells have access to a smaller source of energy. With the immune system, it’s just as simple. Glucose acts as the regulator of the balance between normal cells and cancer cells. Glucose suppresses the immune system – normal cells – thereby allowing cancer cells to act with greater force than otherwise. With AGEs, it’s a bit more complicated, but not that much. First, glucose increases AGEs. Second, ketones reduces AGEs. AGEs in themselves reduce the functions of all kinds of things that otherwise rely on those corrupted proteins. Some of those functions most probably involve fighting cancer cells in one way or another. Taken together, the real problem is one of balance between normal cells and cancer cells, and the solution is to enhance functions of normal cells, regardless of what the therapy does – or does not do as the case with non-FDG avid cancers – to cancer cells directly. Low-carb should still affect this balance, even if it does nothing for those non-FDG avid cancers. Finally, if low-carb does not have an effect, then obviously there’s something else going on here besides carbs-insulin. Sure, the problem could be insulin and insulin signaling, but that still doesn’t tell us what the cause of this problem is. And so imagining all kinds of ways to affect insulin and insulin signaling directly might work, at least as long as the therapy continues, but what then? Imagine a scenario where we ignore the cause and allow it to continue, and treat the intermediate mechanism by which this cause acts instead. We end up with another statin fiasco. Taking drugs for the rest of our lives, sitting on the sidelines, allowing the game to go on. A small tiny tidbit I object to. “The heart and brain normally use a lot of glucose,…” Yes, if we feed it. Considering all we know about diet now, I think it’s time we say it differently. How about “The heart and brain normally use a lot of ketones, unless we feed ’em lots of glucose instead.”? The general principle is that what we know is much less than what we don’t know. I don’t think we know how much especially the brain uses ketone bodies because they may be used as fast as they’re made. The liver exports ketone bodies which it does not use, yet this may still be a beneficial process for an inflamed liver. Ketone receptors on cells may respond by altering cellular metabolism without actually taking in and consuming ketones. For example, the presence of elevated ketones may be taken by all cells as a signal that glucose is in short supply, and trigger fat-burning and insulin-resisting genes, or even trigger apoptosis in or immune attack on cells that can be identified as excessive consumers of glucose. All may be important. Again, we are just at the beginning. I don’t actually believe any of the interactions are terribly simple, but, as in most experiments, we set limits on what we studied in order to learn something rather small. I hope to address some of the issues you raised in next week’s post. A preliminary description of our expectations are within my last comment. I skimmed the pilot study and I understand the need for limits there. Dr Fine, I’d like to share some of my insights into what I think is a problem that is not often addressed or even acknowledged for that matter. On the one hand, there’s mechanistic studies that try to see how things work. This would be metabolic ward studies where subjects stay on the premises for the entire duration. On the other, there’s real world studies that try to see how it works free range as it were. This would be studies like the A-TO-Z study comparing 4 popular diet books. In this particular study, what Dr Gardner really tried to do was to see which set of instructions would produce the best results. He didn’t actually compare the dietary interventions themselves, that would require a mechanistic study. The problem is that this study is presented as a mechanistic study where we assume – we believe – that the data collected through food questionnaires is what produced the results. This also appears to be a problem of the pilot study above in my opinion. The pilot study design had some safety measures to make sure subjects followed the instructions as written. Sure, but that won’t turn it into a mechanistic study. The instructions are called a “welcome packet” in the paper. I’m wondering who wrote that welcome packet and if the one chosen here was ever tested for performance in a previous study comparing multiple different welcome packets. Rather, I’m wondering what this study was really a pilot for – welcome packets, or dietary intervention? The nature of a study is determined by what the controlling variables are, not how the experiment was set up or how it is described by the experimenter. The A-Z trial compared response to a “set of instructions” and his paper showed weight loss as a function of time on the instructions. However, the data included values for triglycerides (TAG) and reported carbohydrate intake at each of the time points on each of the diets. If you plot one against the other, you see that the data show that (within the limitations of dietary recall) that dietary carbohydrate is the independent variable and TAG depends linearly on carbohydrate. I published this someplace but you can do it yourself. It’s only 16 points. I described a similar effect in a previous post: Krauss studied calorie restriction but when you calculated carbohydrate content, you see that this was the controlling variable. In Fine, et al., the welcome packet was well studied but some of the important information comes from looking at levels of ketosis as the independent variable. I understand, Richard. 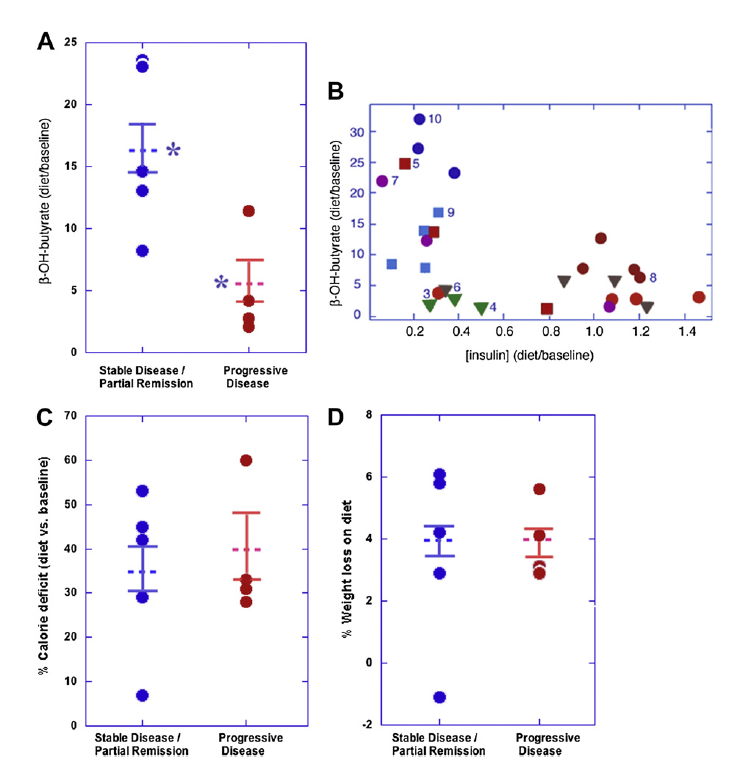 A proxy – ketosis – was used to deduce adherence, then ketosis was plotted against disease progression. This brings me back to my first comment. Since adherence was not measured directly, we can’t be sure the lack of ketosis in the 4 non-responding subjects was the result of non-compliance. We have to ask if there’s something else going on besides carbs-insulin. I expect we’ll find something. I am sure that there is much going on that we don’t know about. However, it is primarily ketosis that we are interested in, not adherence. Wouldn’t the addition of milkshakes made from heavy cream help to offset the cachexia produced form the ketotic diet? One should be able to formulate one which is delicious without added carbohydrates, possibly using stevia as a sweetener to avoid artificial sweetener problems. I know that there has been some data which shows an increased insulin response to butterfat, so perhaps a coconut milk smoothie instead? We did have an experienced low-carbohydrate dietitian and some kinds of shakes were used but I would only say that these were seriously ill patients and it is not as easy as normal dieters. I would add, however, that both Jeff Volek and Ron Krauss in different experiments in which they tried to restrain participants to weight maintenance, found that some lost weight anyway. One might go so far as to say that this might be a reason to try such a diet for intended weight loss. Just to amplify on Richard’s comment: we actually did supplement diets with low carb shakes to which we added cream. As Richard pointed out, the patients lost weight anyway, and had reduced calorie consumption vs. calculated needs. What are your thoughts on low carb/ketogenic diets helping our bodies beat cancers before they grow large enough to be detected. Do we have any idea how many of us (if any) get cancers but ultimately fight them off without treatment. I believe that epidemiological reports of a strong association of high insulin concentrations and of obesity with cancer risk are likely to represent real risk and that reducing our daily carbohydrate intake will reduce our overall cancer risk. However, many cancers are likely induced by other factors, such as smoking, air and water pollution, chemical carcinogens, groundwater contaminants, food contaminants, ionizing radiation (from many sources), etc. I don’t know if we actually fight off cancers with a low CHO or ketogenic diet, but we likely prevent some cancers from forming. You’re referring to Dr. Michael Lisanti’s very interesting work where he describes how stromal cells (cells that are considered supportive cells such as fibroblasts) and macrophages and monocytes (scavenger white blood cells) are actually the ones which are glucose dependent and glycolytic, while he says that the cancer cells are actually fueled by ketone bodies that are manufacture in the nearby stromal cells. He also describes that an injection of betahydroxybutyrate into the animal caused increased tumor growth. First, we had no expectation that all cancers would respond to diet alone. After all, we don’t see most cancers respond well to cocktails of multiple chemotherapeutic agents. And failure of diet is consistent with our hypothesis, which allows for continued disease progression in about one-third of patients, as well as with our clinical data. (I’ll discuss our hypothesis in next week’s post). So I’d have nothing in principle against his research purporting to show this effect (four papers appearing in Cell, September 2011). However, his pathologic slide of a tumor shows that it consists of perhaps 75% stroma and 25% tumor by area, or close to 90% stroma by volume. This is quite different from the vast majority of human cancers, which are predominantly made up of cancer cells. Granted, some human breast cancers do indeed have more stroma than usual, but not the majority of tissue. Further, most human cancer types that have been tested have shown over-expression of glucose transporters and of FDG uptake within the cancer cells, not within the stroma. So my biggest concerns are that a) he’s dealing with an artifact of a human cancer growing in a mouse, which doesn’t represent what happens in humans and b) he hasn’t actually shown glycolysis in the stromal cells (the essence of what he terms the reverse Warburg effect and c) an injection of a ketone body is not at all the same as systemic ketosis due to reduced insulin signaling. thanks for your work. I read about the Warburg effect and efficacy of low CHO diets a few years ago through the work of Dr. Thomas Seyfried, who you cite in your paper. In an interview on one of the low-CHO blogs, he made the comment that he believed the best preventative cancer therapy he could think of would be a yearly therapuetic fast. The data seems compelling and fasting is not inherently harmful, so I took his advice – I fast for a 7 day period on distilled water once per year. I have an extremely strong history of family prostate cancer, although I’ve never had the disease myself. I’m disapointed that prostate cancer is not glycolytic – that chips away at my resolve as I go without food for a week! But if the anti-cancer strategy is one of insulin signalling, I wonder if prostate cancer may put at metabolic risk by fasting, same as other, glycolytic cancers? Do you have insight into that question, or maybe it can only be investigated by adding people to the test groups which have non-glycolytic cancers. You’re right: most prostate cancers are not ‘Warburg tumors’, although up to 20%, i.e. those that behave more aggressively may well be. That said, we haven’t studied prostate cancers and it would be very difficult to speculate on what might work as a preventive measure. I’m sorry I can’t be of more help. Dear Dr. Fine:Thanks so much for your outstanding work! I would like your thoughts regarding ketogenic diets for patients in remission from Leukemia. My 48 year old athletic wife suffered from AML/MDS with Trisomy 8 and appears to be in full remission about 50 days post an Allogenic Bone Marrow Transplant. MD Anderson reported in 2010 that “Leukemia cells, like most cancers, are addicted to glucose to generate their energy, but new research shows for the first time that these cells also rely on fatty acid metabolism to grow and to evade cell death…. our results suggest that leukemia cells are addicted to fatty acids for the function of the Krebs cycle and the prevention of cell death.” (http://www.mdanderson.org/newsroom/news-releases/2010/researchers-find-leukemia-cells-metabolize-fat-to-avoid-cell-death.html). I am trying to ascertain whether this calls into question the benefits of a ketogenic diet for patients in remission form Leukemia. On the one hand, such a diet could foster her staying in remission, as it would starve any minimal residual Leukemia cells of glucose for energy. On the other hand, such residual leukemia might benefit more from the higher fat in a ketogenic diet and the fatty acid metabolism for growth and evasion of cell death. What are your thoughts, and if a ketogenic diet is not warranted, what fat/carb/protein percentages would you advise? Thanks again and I look forward to following your work! In general, our results don’t support ketogenic diets for cancer treatment as we’re only in the very early stages of research and we we’d need to identify good biomarkers of responsiveness to a ketogenic diet to answer your question. I’m sorry that I can’t be more helpful. Very interesting post; thought provoking. I have one question: is it possible that the tumors adapt to other fuels (eg, ketones) and don’t take up as much FDG? In other words, have these findings been confirmed with a technique that doesn’t depend on tumor glucose uptake? It certainly is possible that tumors may adapt to ketone bodies. Some investigations have reported tumors that can utilize ketone bodies. Further, cancers are, almost by definition, evolutionary masters which constantly find ways to fill new environmental niches. In general, most cancers are very heterogeneous genetically. In face of cancer therapy, this heterogeneity allows a single surviving cell to repopulate new (resistant) cancer clones within the body. As for techniques that are independent of glucose uptake, I am assuming that you’re referring to the possibility that dietary carbohydrate reduction, in causing reduced serum glucose concentrations, could therefore possibly confound interpretation of 18F-FDG PET scans. This is theoretically true, but frankly quite unlikely from a physiological perspective. Reduced insulin, if it reduces plasma [glucose], if anything would increase the relative blood concentration of a fixed injectable dose of FDG. If the results show (as they did) that FDG uptake actually went down, then the real effect may indeed have been greater than the measured effect. But in answer to your question, there are indeed other radiotracers that could have a role in cancer imaging. F18 labels of glutamine have been developed. Whether tumors that can metabolize glutamine as an energy source would be inhibited by a ketogenic diet is an experimental question that hasn’t yet been answered. Our metabolism was not designed to use pyruvate from ketones and carbs at the same time. In fact there are several metabolic pathways including glucose uptake and glucose storage that cannot function at the same time. The body will choose one or the other. Ketones also have to include healthy oils and monosaccharide vegetables as well as supplements and steps to promote a healthy alkaline level. Proteins that cover all non essential and essential amino acids, supplements , exercise, healthy oils , green tea with lemon added to promote alkaline monosaccharide vegetables all this can up-regulate the P53 protein to kill cancer cells. Thanks for comments but I think some of what you say is not quite right. We don’t get pyruvate from ketone bodies but rather from carbs or gluconeogenesis from alanine (the reaction KB –> acetyl-CoA -X–> pyruvate is too unfavorable) which is why we can’t use fat to make protein. I am not so sure we know about the other factors. What I do know proteins create an acidic metabolism it is extremely important to add supplements and foods that encourage the body to maintain it’s alkalinity. I do not know what an acidic metabolism means. not belong here especially plants such as corn that are high in the carbon 13 isotope. I believe that people eating low carb diets are likely to have a lower incidence of cancers than those on a high carb diet. As I’ve mentioned, there are many other likely environmental factors that contribute to DNA mutations (see my reply at 10:26 PM, October 15), so from that point of view cancers will not go away. I also believe that if a cancer were to arise in someone on a low carb diet (there’s no fundamental reason that this couldn’t happen, even if it were less likely), then treating it with a low carb diet would probably be useless. Thanks. Good question. In preliminary cell culture data of seven different cancer lines we’ve shown that acetoacetate added to culture medium inhibits cancer cell growth and ATP production compared to glucose medium alone. These findings were not present in fibroblast controls. The data are consistent with, but not definitive for acetoacetate reducing the rate of glycolysis. But we also don’t know whether glucose uptake itself was reduced by the alternate fuel source. Others (refs 2 and 3) have similar findings. We’ve also shown that a one month very low carbohydrate diet, producing about a 4 fold increase in ketosis in Wistar rats decreases cardiac uptake of FDG by an average of 70%. Again, these data are consistent with the possibility that alternative substrate (i.e. not glucose) is supplying the heart with fuel. The heart, however, may not be a good model for a cancer cell since heart’s rate of glucose uptake is more sensitive to insulin. Summary: what you’re suggesting is possible but not proven, to my knowledge. Also the info that CHO restriction is still somewhat effective, possibly by other “downstream” affects, one of which is raised ketone levels. A further question arises as to whether the Ketone level is merely a marker for some other affect, or whether the Ketone is itself beneficial, possibly in association with one or more other “downstream” affects. Also I appreciate the practical and ethical difficulties in getting seriously ill patients to take on a challenging ketogenic diet. In light of this there might be benefit to testing “direct feeding” of ketone precursors such as CO or MCT which might raise ketone levels without the ordeal of a ketogenic diet. I’m particularly thinking of the “Dr’s Newport” story here, http://www.cbn.com/cbnnews/healthscience/2012/january/coconut-oil-touted-as-alzheimers-remedy/ . Obviously it may not work in a non-CHO deprived environment, but that would be one more piece of data, and being GRAS it should ease regulatory and ethical concerns. Ketone bodies could be a marker for something else but because they are an efficient fuel and tied to metabolic signalling a direct effect is still our main hypothesis. Gene’s argument which will be laid out in the upcoming post (tomorrow or next day) will explain the evolutionary argument which proposes the possibility of miracles along the lines of Dr. Newport but has as a caveat that some people might not respond to ketone bodies at all or even, much less likely, the cancer may like ketone bodies. It’s been a long time since you wrote this but I hadn’t seen all of the comments. Direct ketone precursors may indeed have value in selected patients. This would reproduce some but not all of the effects of a ketogenic diet. A carbohydrate restricted ketogenic diet inhibits insulin secretion. Since insulin serves as a growth signal to all cells including cancers, then Inhibition of insulin secretion by reducing insulin signaling at the cancer cell membrane could provide an added benefit to some cancer patients. (I don’t say all because in some patients their cancers have genetic mutations that make them insensitive to insulin inhibition). We all know too many people with cancer so I think it is a very important topic. A Big thank you to Richard and Eugene. Having a close family member with severe epilepsy I would just like to emphasize the holistic nature and many pathways effect that characterise Ketogenic diets. The Main focus here is Insulin Signalling to the cancer cell itself. But we need to remember that Ketogenic diets work through many systems You only have to look at the epilepsy research. many mechanisms are proposed . eg adenosine A1 receptors , Polyunsaturated Fatty Acids Acting on Voltage-Gated Ion Channels , increasing concentrations of kynurenic acid , potassium ion channels ,mitochondrial biogenesis and Autophagy to name a few. Insulin Signaling itself is changing the whole body environment not just the cancer cell. What about HDL Cholesterol? Seems to be involved in immune function and cancer. There could be many benefits from a Ketogenic Diet, e.g., pain relief, cachexia. Sswitching on Autophagy might be a big one. This seems to require both protein and carbohydrate restriction with a calorie restricted ketogenic diet or fasting. All of these could be involved. We are just at the beginning. N.Z.s North and South magazine publishes quality articles referencing Taubes, Yudkin, Lustig and quoting top N.Z. scientists beginning to agree that the phoney war on fats may be over. Also a page on the hygiene hypothesis with regard to obesity. Very encouraging and welldone. Focuses a bit much on sugar over total carbs and leaves out omega 6:3 balancce, but a mark of significant progress and the beginnings of change. Thank you very much. I think that in general the demonization of fat is decreasing and that we’re hearing more about the health problems associated with carbohydrate-related insulin effects. I too have leukemia (CLL stage zero) and cannot tolerate nor thrive on a low carb high fat diet. Thoughts? I am in general familiar with Peat’s work and although we don’t agree on everything, like most of his stuff but I will have to read the particular passage. On leukemia, I wish we knew more. In general, even where we have hard knowledge like diabetes, a low carb diet is “the default,” the one to try first. It does not work for everybody and not everybody likes so science dictates that it is the place to start. I am so sorry that your leukemia does not respond to a low carbohydrate diet. I am not very familiar with Peat’s ideas, but I will now make an effort to read them. Generally speaking, our hypothesis and results do not suggest that there is a unique dietary “answer” to cancers, including low carbohydrate diets. I am somewhat skeptical about any approach that claims to provide a unique answer to cancer therapy since cancers vary so widely, not only among different cancer types, but even among the cancer sites within a single individual. That said, I sincerely hope you find a treatment that works for you that you find tolerable. Hello Dr. You say glycolytic cancer cells can find sugar to burn in the bodies even under low sugar environments. For example during low carb diets. Do you think there’s enough sugar for cancer cells to survive even during full therapeutic fast of some duration (e.g. 1-2 weeks)? sorry for the delay in answering this but I think I was just not sure what the question is. Of course, as said before, there are so many different cancers but the effect of a therapeutic fast may be de facto carbohydrate restriction and many cancers may over-express GLUT1 receptors and may be able to compete even better than the host under these conditions but probably there are too many factors to predict exactly and the major point is that we are just beginning to understand where ketone bodies fit in. It’s possible that greater effects would be seen during full therapeutic fasts of a week or two, but we haven’t explored them at this point so their full effects on cancers are, as yet, unknown to us. My general expectations are that cancers are sufficiently flexible and adaptable that no single intervention will kill all cells. A reasonable goal, from my perspective, is to kill and inhibit cancer cells with better efficacy and lower toxicity. I think that a low CHO diet is well tolerated and may well synergize with other therapies to lower their doses (i.e. toxicities) and improve overall efficacy. Of course these effects must still be proven. I actually didn’t exactly follow your comment on low-carber forums and my comments there seem to have disappeared but the bottom line is that the reason for targetting insulin is not phenomenological. As I described in the Suddenly last summer post and as Gene will bring out in part II (tomorrow or next day), it is the consistency with the bigger picture of insulin in cell signaling. I can’t find the reference but I believe Kiernan Clarke was involved in an experiment where subjects in an advanced state of ketosis were given an insulin infusion that brought their blood glucose levels to below 30 without symptoms. If I’m not remembering wrong that level might be low enough to starve cancer cells that do exhibit the Warburg effect. I found the study. It was nine obese men who were fasted for two months and then administered an insulin infusion to the point that blood glucose levels were as low as 0.5 mmoles/liter (9 mg/100 ml) yet failed to precipitate hypoglycemic reactions. It would be interesting to see if that low of a blood glucose would starve cancer cells. Thank you for your very interesting comments. I think they are all very relevant. There are other references for achieving even higher levels of ketosis in rats, up to 5 mM on diet alone. But the idea of achieving ketosis in humans sufficient to blunt the symptoms of severe hypoglycemia is fascinating. I will look at the reference because frankly I’m skeptical that red blood cell function can be sustained. KB’s might indeed replace glucose as a principle nutrient for brain metabolism, but oxygen delivery via RBC’s would seem to be jeopardized as erythrocytes can’t utilize KB’s. Anyway, very interesting and I will look it up. Thanks for your kind words, Dr. Fine. Yes, what is especially fascinating to me is that this was done in the early 1970s! I wasn’t aware that anyone even thought about ketosis other than DKA at that time. Ketosis may not be the cure for every kind of cancer, but this is definitely a promising line of inquiry. If someone could be put into a level of ketosis by fasting or a ketogenic diet such that they could tolerate a continuous infusion of insulin instead of a bolus of insulin, and held there for several days, it might indeed kill any cancer cells that exhibit the Warburg effect, or at the very least greatly augment the effect of radiation or chemotherapy. Curious if it’s the sugar or the insulin. Recently learned that many cells (e.g. muscle and fat) don’t have GLUT transporters (which bring sugar into the cell) on the cell surface at all times. Insulin causes the GLUT to migrate to the cell surface, in which case injecting a cancer patient with insulin maybe exactly NOT what to do. So the potential efficacy of low-carb/fasting may be super low insulin levels which put the cancer under stress because it makes it harder for their GLUT to migrate to the cell surface and bring in the sugar which the body always maintains. Now some cells, brain, nerve, pancreatic beta-cells, always have GLUT on the surface so it seems less likely to work for this. First, there are different GLUT receptors. The GLUT4 receptors on muscle and adipose are insulin-dependent but that is not all or none. Most cells have substantial GLUT4 on the surface. Some tumors, however, over-express GLUT1 receptors which do not depend on insulin. Insulin has global effects as well, but certainly, one of the benefits of low carb diets is that it reduces the fluctuation in insulin (which may be more important then the actual level of insulin but Gene’s hypothesis also stresses the potential importance of ketone bodies. along with ketogenic diet , you will need to target heat shock protein by raising body temperature to up regulated specific heat shock protein. The overall effects of ketogenic diets as a cancer therapy for humans are in early stages of testing a hypothesis. It’s a very plausible hypothesis, to be sure, but still must be considered unproven. Additional or complementary effects of up-regulating heat shock protein would also have to be considered hypothetical until tested experimentally. I’m not aware of literature on this application so I’m very curious to know if there is specific supporting evidence. Medicine is a dead end approach to treating all conditions and illnesses. As research proceeds on reversing hypermethylation of ubiquilin genes they might finally realize nature is superior to science. Upregulating heat shock proteins is a delicate balance in fighting cancer over or under expression with medication will increase mortality. When you truly understand the science and nature of the power of foods to heal then you will know as I do the cause of illness and how to heal. modern medicine does not or will not look at the cause so how could you possibly know how to heal. Targeting insulin inhibition as a metabolic therapy in advanced cancer. Part 2. The hypothesis.